HEPCO Model T3700-2 : HEPCO, Inc. 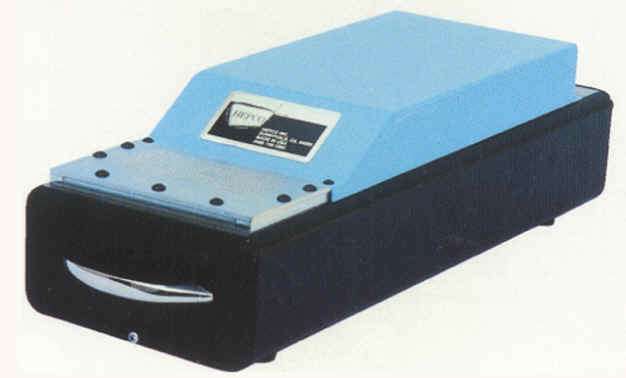 The HEPCO Model T3700-2 is a Heavy-Duty Shear Machine for the majority of radial-leaded components, including connectors, transistors, coils, trimpots, DIP ICs and capacitors. The steel frame and stainless steel cylinder, coupled with the high-flow valves, allow for quick, clean shearing of leads, and a tremendous machine life. A large shear area of 1.9" x 4.4" (1.9" by 6" optional) accommodates the majority of shear requirements. Custom plates with patterns to customer specifications are also available. The blades feature hardened, high-carbon steel and unique geometries to provide the long life and clean cut required in your most strenuous applications. Need custom patterns or hole sizes? CALL AND ASK!